It is so nice to be excited about an episode of Doctor Who again, it’s just been so long. I can’t quite believe how refreshing this episode was in all the murk of the season thus far, and I think we need to hang onto it while we can. The Doctor and Clara, fresh from some recent escapade, land back on Earth so that Clara can lunch with the love of her life, Danny Pink. Of course, Danny still doesn’t know that she’s off travelling with the Doctor again so that’s probably going to be a sore point. All I can say is, the less Danny the better. Something has caused the TARDIS to shrink with the Doctor trapped inside it, making for an interesting role reversal for the Doctor and Clara. Clara investigates the surrounding areas, with tiny Doctor in her handbag (in the TARDIS of course) while he instructs her on various details. I should mention actually that the Doctor is regular size. It’s the TARDIS exterior and the dimensions that are being messed with. This means that only the Doctor’s hand can fit through the TARDIS doors. Clara takes this opportunity to role-play the Doctor while asking the locals if anything strange has been happening in the area. She meets Rigsy, a local graffiti artist who is doing community service for tagging the area. He tells her that people have been going missing; he’s lost an Aunt himself. He has a theory that perhaps the people never leave the rooms that they were last seen in. Rigsy and Clara investigate (using the sonic screw driver, psychic paper and the tiny Doctor on the phone) and encounter a strange creature that looks a little bit like melting plastic and dripping paint rolled into one. The Doctor explains that it is turning people into two-dimensional objects, though he isn’t sure if it is doing this purposely or not. When the creatures attack in a tunnel, Clara is left to defend and lead a group of community service workers and their minder by asserting her authority and knowledge in much the same way that the Doctor would. The group try to communicate with the creatures, who respond with threats and begin picking off members of the group one at a time. Thankfully, this isn’t very long drawn out, the creatures are incredible proficient and the group soon find themselves running down old railway tunnels attempting to escape. 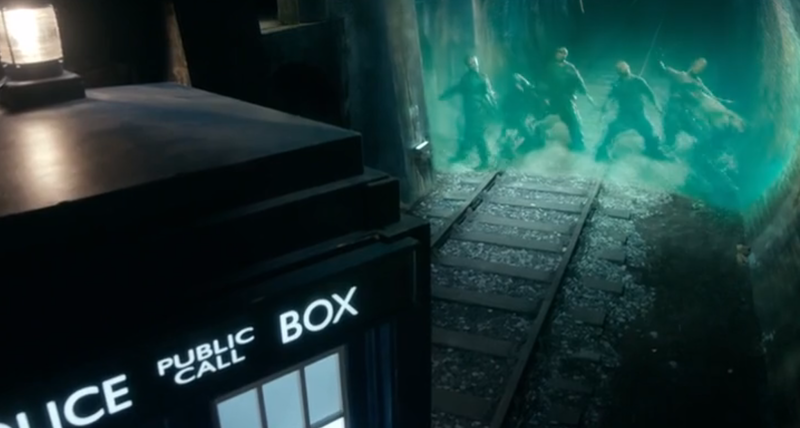 Clara loses the TARDIS and it is subsequently hit by a train with the Doctor inside, forcing it to activate its siege mode; no one comes in and no one goes out. 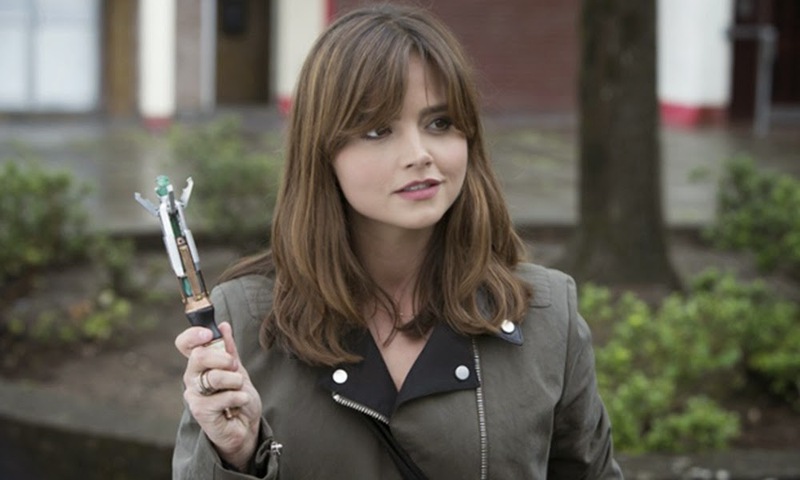 With the Doctor facing the very real threat of death, Clara tries to keep the rest of the group together and establish communication with the Doctor. 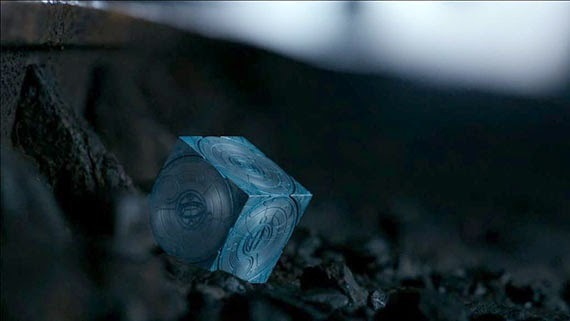 Although she is not successful, she manages to find the TARDIS and uses her own ingenuity, with a dash of ‘what would the Doctor do’ to restore the TARDIS to full opertation and size. She has Rigsy paint a picture of a door so convincing that the creatures will try to work on it to reactivate a 3 dimensional structure. Because it isn’t real, the power passes through the painting and into the TARDIS behind the door, concentrating energy and allowing it to rematerialize at normal size with a furious Doctor inside who is quick to dispatch of the creatures. After dropping the survivors off, the Doctor notes how well Clara did, how good she was at being the Doctor. He follows this up with a comment that goodness itself had nothing to do with being the Doctor, implying as we all have been led to believe, that the Doctor does not like who he is. As Clara stands mystified, Missy watches her on a screen and declares that she has chosen well, implying that Clara has been chosen for something. Even though Clara’s accomplishments in the episode were both linked to the Doctor and branded as being something sinister and something not to be proud of, I still think it’s important that we got to watch Clara be clever and be the kind of person that the Doctor ordinarily would have by his side. She started to understand through playing Doctor for a day, how hard his decisions are to make and why he does what he does, what the burden is that he has to live with. Although she doesn’t yet fully understand what he finds so miserable about the whole thing, she certainly understands much more than she did before and the viewer can trust her more as a result. My main concern is that I am being positioned as a viewer to believe that what she and the Doctor do is never enough and is a bad thing ultimately. I don’t really understand how saving the majority of people in most cases, because you aren’t quick or clever enough under intense pressure, places any burden of responsibility on you for those people’s lives. It sends a very twisted message about who the Doctor is, what his companions are and what the show means for it’s viewers. Doctor Who is about hope primarily, not about doing ones best and being told it’s either not enough or in some way evil. This is why I find it next to impossible to engage with this storyline. In the meantime, Clara pretty unsuccessfully lies to Danny on the phone about where she is and then rejects his call. The Doctor commends her ability to lie not to Danny but to the Doctor himself citing it as a survival skill, and we can’t quite tell if he is being serious or not. Clara lying to this guy makes no sense, not that it ever has, because it again diminishes the validity of her choice to travel with the Doctor, as if it’s a dirty and sinister thing. I wouldn’t mind betting that this is what Moffat and Co. are going for, though I don’t think it is proving successful right now. Making viewers mistrustful of both the Doctor and Clara doesn’t make them mysterious or alien, it makes them cruel and unlikeable. I can understand the Doctor being painted as more of an alien, with Clara trying to provide a human lens into his life, but this is not how the characters are being developed. They are plain cold, heartless and not to be trusted nor role modelled in any way. 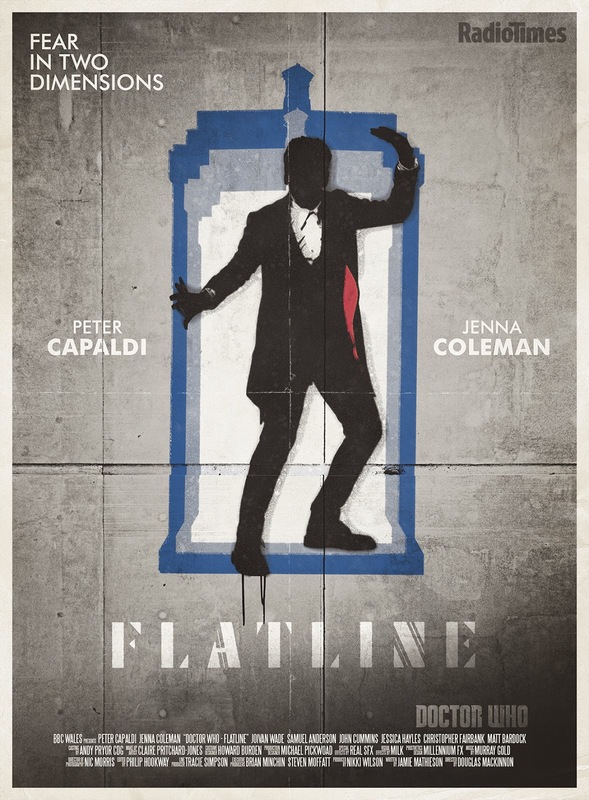 If the connection between the Doctor and the Companion isn’t right, no matter if the Doctor is alien, accessible or mysterious, no matter if the Companion is a genius, of another world or time or a love interest, then the show will always flounder. That relationship, for all comments about plot and characterisation, is the heart of the show and unfortunately, even in this far better episode, the spark was still absent and the plot actively unravelled any progress in the last scenes. I can only hope that this twisted and cold Doctor has something wrong with him and that this is part of the overarching plot or I am going to be pretty unhappy. Next week has me torn as there are many children and animals which could be fun, but it also has Danny Pink in a central role which could be the worst.